An electric rotating machine energized by direct current and used to convert electric energy to mechanical energy. a DC machine that operates as a motor. DC motors cost more and require greater expenditures on maintenance than AC motors. They permit, however, smooth and economical speed control within wide limits. For this reason, they have found broad application in, for example, rail and railless electrified transport, cranes, rolling mills, and automation equipment. The principal characteristics of DC motors are (1) the dependence of the motor speed n on the shaft torque—the speed-torque characteristic—and (2) the dependence of the torque on the armature (rotor) current IAr. 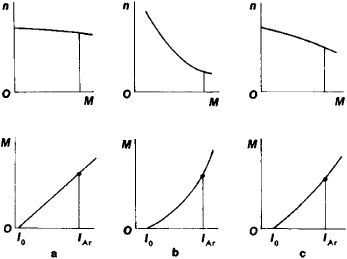 The shape of the characteristic curves (Figure 2) is determined by the excitation system of the motor (Figure 1). Depending on the method of excitation, DC motors are classified as separately excited (series), shunt, or compound motors. In separately excited and shunt motors, the speed varies insignificantly, and the speed-torque curve falls only slightly. Series motors are used if the speed must be variable within wide limits when a change of torque occurs. For this type of motor, the speed-torque curve drops markedly. In separately excited motors, the speed may for various reasons increase as the torque increases—with a resulting unstable operation of the motor. Compound motors are often used to assure stable operation, which can be achieved if the speed-torque curve falls with increasing torque. In this type, the main magnetic flux is provided by the shunt-field winding, and the series winding is used for stabilization. The speed-torque characteristic of compound motors is of an intermediate type. When a DC motor is connected to a power supply, the magnitude of the current in the armature winding (the starting current) exceeds the rated current by 15 to 20 times. The reason for this is that at the moment of starting the counter electromotive force of the armature is equal to zero, and the current is limited only by the resistance of the armature circuit. To reduce the starting current, a starting resistance is inserted in the armature circuit. This resistance is gradually decreased as the speed increases. After the start-up is completed, the resistance is short-circuited. Shunt motors have a speed range of approximately three to one. A rheostat in the field circuit is the most convenient and inexpensive means for adjusting the speed of such machines. The speed can be increased or decreased with the efficiency remaining sufficiently high at all speeds. In series motors, the speed can be decreased by a rheostat in the armature circuit and increased by connecting a shunt resistance in parallel with the field winding. The losses in the rheostat inserted in the armature circuit lower the efficiency substantially. Shunting the field winding does not change the efficiency substantially. In the USSR DC motors are manufactured in standard series. For example, series DK features power ratings of 40 to 110 kilowatts (kW) at voltages of 250, 350, and 750 volts (V); speed can be varied from 0 to 4,000 rpm. This series is used for electrified urban transport systems. Series D has power ratings of 2.5 to 185 kW at voltages of 220 and 440 V and a speed range of three to one. Series D is used, for example, in drives for high-power rolling mills and for all types of cranes. Electric drives that use DC microelectric motors are widely used in automatic control systems and in electric household appliances. The main advantage of such motors over AC motors is a considerably greater range and precision of speed control. Rotation of a dc motor is produced by an electromagnetic force exerted upon current-carrying conductors in a magnetic field. For basic principles of motor action See Motor. Direct-current motors may be categorized as shunt, series, compound, or separately excited. The field circuit and the armature circuit of a dc shunt motor are connected in parallel. The field windings consist of many turns of fine wire. The entire field resistance, including a series-connected field rheostat, is relatively large. The field current and pole flux are essentially constant and independent of the armature requirements. The torque is therefore essentially proportional to the armature current. Typical applications are for load conditions of fairly constant speed, such as machine tools, blowers, centrifugal pumps, fans, conveyors, wood- and metal-working machines, steel, paper, and cement mills, and coal or coke plant drives. The field circuit and the armature circuit of a dc series motor are connected in series. The field winding has relatively few turns per pole. The wire must be large enough to carry the armature current. The flux of a series motor is nearly proportional to the armature current which produces it. Therefore, the torque of a series motor is proportional to the square of the armature current, neglecting the effects of core saturation and armature reaction. An increase in torque may be produced by a relatively small increase in armature current. Typical applications of this motor are to loads requiring high starting torques and variable speeds, for example, cranes, hoists, gates, bridges, car dumpers, traction drives, and automobile starters. The field winding of a separately excited motor is energized from a source different from that of the armature winding. The field winding may be of either the shunt or series type, and adjustment of the applied voltage sources produces a wide range of speed and torque characteristics. Small dc motors may have permanent-magnet fields with armature excitation only. Such motors are used with fans, blowers, rapid-transfer switches, electromechanical activators, and programming devices. 4 percent compound annual growth rate since 1986 in the use of brushless direct-current motors and drives in the United States. Direct-current motors drive the chair in both altitude and azimuth at fast and slow speeds. A Vermont county extension service agent contacted the Rural Information Center when a handicapped small-business client, seeking a USDA Small Business Innovation Research (SBIR) grant, needed the names of electrical contractors who built small variable-speed direct-current motors the businessman needed for his specialized wheel chair invention. Direct-current motors have been popular since they displaced steam engines as a source of train propulsion in the 1940s.